Figure 1. Left: Time- and longitudinally averaged wind-stress. 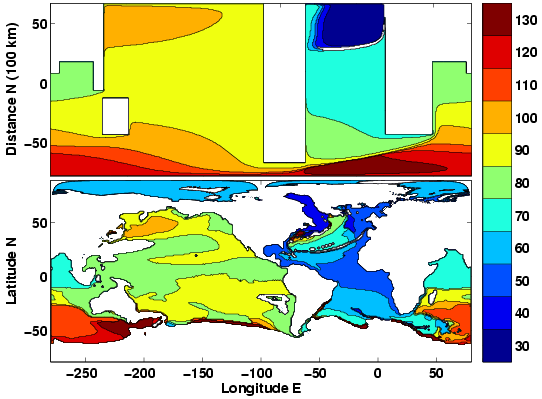 Right: Contours of oceanic mass transport (in black) and contours of sea surface temperatures (in colors). The transport of sea surface temperatures by the oceanic currents creates a thermal front beneath the westerlies' maximum. The large-scale oceanic currents that redistribute heat, salt and momentum in the top kilometer of water are driven by the mechanical stress exerted by the winds at the air-sea interface. In turn, the surface winds are shaped by the north-south temperature differences in the atmosphere. The temperature gradients in the atmosphere, largely determined by the sun's differential heating, are mitigated by the poleward heat transport due to the oceanic currents and the atmospheric flows. Thus, the ocean and the atmosphere work together to make our planet livable. Understanding the partitioning of heat transport between atmospheric and oceanic components, and how fluctuations arise because of the mutual interaction of the two systems, is a crucial aspect of climate dynamics. One approach is to construct simple models based on fundamental conservation principles of heat, salt and momentum. An example of oceanic and atmospheric fields resulting from one such model is shown in figure 1. Figure 2. The time of arrival of the first maximum in SSH in response to a change in the northern North Atlantic is contoured in years. White areas are either continents or values outside the contoured range. (Top) A solution of a one-layer model of the World Ocean in simplified geometry, forced in the northernmost North Atlantic by a thickness anomaly with a period of 100 years. (Bottom) Corresponding results for the SSH anomalies in a three-dimensional OGCM forced by wind and buoyancy gradients. The SSH anomalies are the difference between a perturbed experiment (where deep convection is interrupted in the Labrador Sea by a local anomalous freshwater flux) and a control experiment (similar to modern observation). The anomalous freshwater flux is a sinusoid in time with a period of 100 years. The global adjustment of the upper ocean in response to localized anomalies is effected by planetary waves which propagate from one basin to another in several decades. Planetary ocean waves give rise to a global seiche, such that the volume of thermocline water decreases in the Pacific-Indian Ocean while increasing in the Atlantic Ocean. The propagation of a disturbance from the North Atlantic is illustrated in figure 2, where the arrival times of the first maximum of sea-surface height (SSH) are shown. From the source region in the North Atlantic a wave propagates equatorward along the American coast. At the equator it moves eastward and then splits into two waves moving north and south along the eastern boundary of the Atlantic. At the southern tip of Africa the wave turns eastward until it finds its way to the Indian and the Pacific oceans. The wave acts like the El Ni�o, travelling eastward along the equator until it penetrates poleward along the eastern boundary. From there, the disturbance is radiated westward in the form of slower Rossby waves that 60 years after the initial North Atlantic anomaly fill the entire basin. A salt flux perturbation in the North Atlantic generates a global seiche which may trigger an El Ni�o in the equatorial Pacific several decades later.